The adorable design on the bib came from my blogging friend Megan of A Kitschy Kitchen. Click here, and this original drawing can be yours, too, as a gift from Megan! Since I used a heavy muslin (a remnant I had on hand) for the bib, I was able to simply trace the design. Then I embroidered it while watching TV when we were snowed in. 🙂 Megan has an Etsy shop, too . . . here’s a post about it! The skirt, bib ruffle, and neck and waist ties are made from this fabric I bought from Karen of KRS Designs. The cute baking motif was perfect for this project! You can find links to all of Karen’s shops on her blog. And now for the ruffles. The blue one was from a gift of fat quarters I got for my birthday. It has a seam in the middle, but it’s pretty well hidden. The fabric for the pink and brown ruffles came from Laura of LC’s Cottage. Click here for Laura’s blog, here for her Etsy store, and here for a previous post I wrote about her shop. Details about the design are available on my Wonder Woman Retro Apron post . . . a free tutorial from the Jo-Ann web site along with a few tweaks of my own. The only thing I changed on this one was to line the bib to hide the back of my embroidery and make the top ruffle smaller so as not to hide the mixer. you are a crafting goddess, that’s so cute Katherine. love it! what a fun apron!! So pretty Katherine! love the mixer, it’s too cute! That’s gorgeous I love it, great idea !! That’s such a cute apron! You did a great job! Katherine, you are so full of fun and creative ideas! Thank you so much for the shout out too! I’m going to need you to show me how to do this, because this is beyond adorable! I love all the aprons!! You’re on an apron kick! I’m lovin’ it! Love your embroidery on this as well as all the fun ruffles. So cute! Very cute! Great idea for using up fabric! Very clever! Nice embroidery work! Your apron is gorgeous! 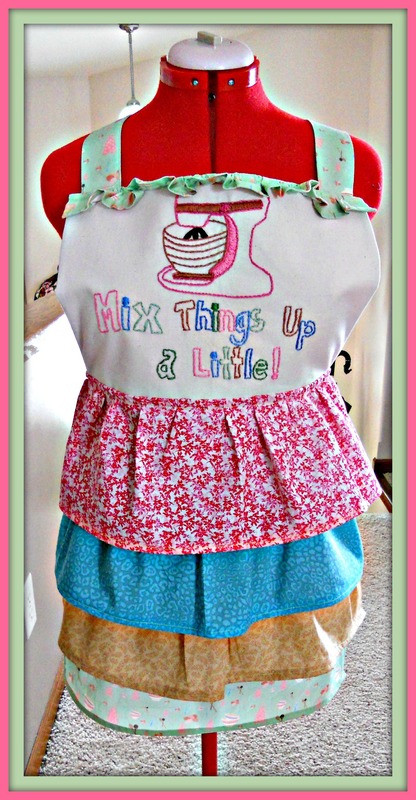 Oh, I am such a nut for cute aprons – both for making them and wearing them…now if only I’d cook. I also wanted to say, you’re the winner!! Your name was the one chosen on the REmissionary for the purse giveaway – just thought I’d let you know. All I need is an address and it’s on its way!! Oh that is really cute, I love it! Oh that’s awesome. Hey where did you get the Dr. Seuss T Shirt? What a cute apron! I love the embroidery on the bodice and that ruffle bottom is just too fru-fru! 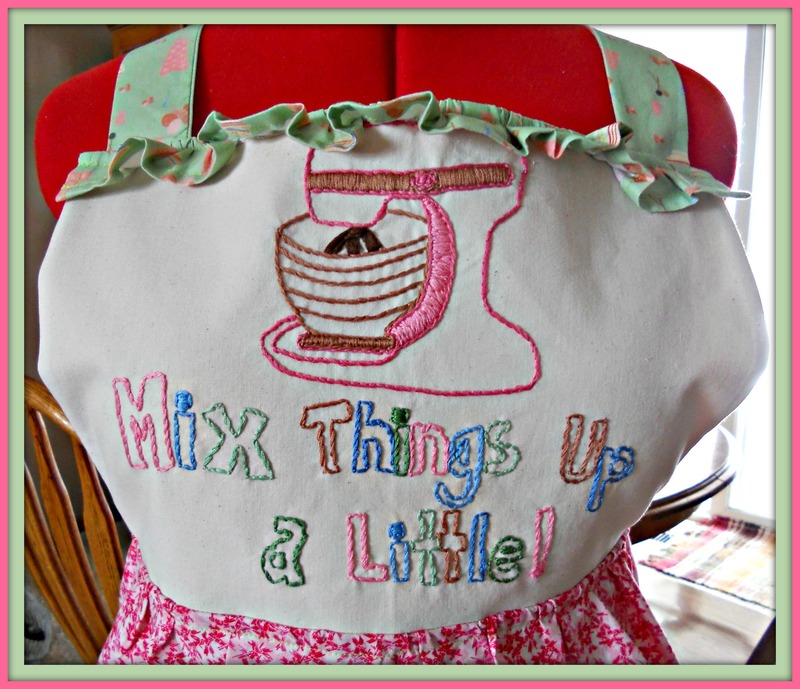 Who wouldn’t have fun in the kitchen with this apron on their body!